Designed to fit the largest of barbecue's. 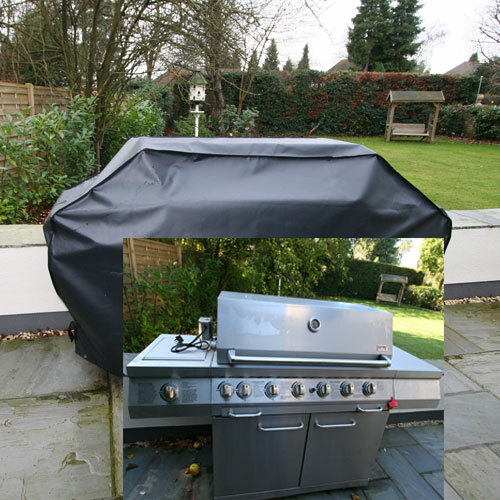 This waterproof cover keeps your barbecue clean and dry. Protects the barbecue grill from rain, dirt, grime, bird droppings, tree sap and harsh effects of the sun. We use the very best textiles in the industry for manufacturing outdoor furniture covers. This is the strongest woven textile in its field, coated with polyvinyl chloride (PVC) on both sides. This heavier textile gives tremendous strength and tear resistance and is heat tested to over 70 degrees centigrade and stress tested to a minimum of 1,000.000 flexes. It can withstand the damaging heat of the sun and our unpredictable winters. This textile is often used in commercial situations due to its immense strength and life span. This textile is waterproof. Kover-it covers come complete with brass eyelets, shock cord and a 5 year guarantee.